Among other controversial statements made by Alain Seban, recently reappointed as president of the Centre Pompidou, one of his latest, Le Monde of 2/3/12, was delivered without the slightest trace of humor, saying that the structure of the "Centre Pompidou Mobile" which he set up was "not expensive". An analysis of the real cost of this veritable Beaubourg Circus (a comparison which is adopted outright in the press release and communications to the public) reveals to what extent certain directors of major establishments have lost all sense of proportion and are totally disconnected from the reality affecting most other French museums. The budget allocated for this mobile Centre Pompidou is in fact colossal, especially when compared to the number of works exhibited : fifteen in all. However, it is true that an institution which manages to let slip by a donation of 5.78 million euros , without ever publicly admitting or regretting its error, and without drawing the necessary lessons, probably finds this "not expensive". The 2.5 million euros invested in the structure are therefore not expensive. This is true as it does not even represent half the price of a Lyonel Feininger painting. 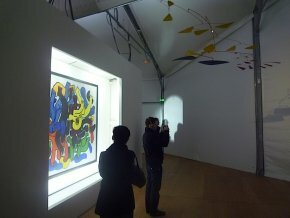 The 400,000 to 500,000€ cost each time the Centre Pompidou travels to another city is not expensive  ! This corresponds to more than half of the total annual budget for the Musée de Cambrai (715,000€) and five times more than it spends every year on its exhibitions , (80,000€). Of these 400,000€, half was financed by the region of Nord-Pas-de-Calais whose president, Daniel Percheron, as we all know has a penchant for a bling lifestyle, and the other half by the city itself. For Alain Seban, 200,000 euros, in this case is really not expensive. But for museums like those in Chaumont  and Cambrai, this is a significant amount of money basically lost, for an "event" which lasts only three months. The entire operation, perhaps in an unconscious manner, gives the impression of a certain contempt towards the visitors who are treated as uneducated children. The way the visit is organized is ample proof : "teenagers and adults [are accompanied] by a comedian who offers to take them on a surprising and unknown "trip into color". This "surprising and unknown" visit consists, for example, in seeing the comedian using the telephone to call, while standing in front of a painting by Georges Braque, L’Estaque, a fictional cousin who lives across from the port painted by the artist, to whom he asks how the weather is and to describe what she sees. A tape then plays the "cousin’s" response, in a heavy Marseilles accent, making it all very colorful. The museum goers are thus treated like five-year olds. We might also quote this sentence from the press release which needs no further explanation : "Its arrival [that of the Centre Pompidou Mobile] should be a joy for the local population.". We can only imagine the cries of glee from the crowd as they welcome the works. These poor provincials rarely have an occasion to celebrate but, fortunately, Alain Seban and the Centre Pompidou are here to help. How condescending can you get ? The exhibition itself, as all those organized under false pretenses, is simply inept. The theme ("color" for which just about any work fits the bill) as well as its treatment, assembling objects with no obvious connection, except for the fact they are "in color"...Such a subject might conceivably be treated in an intelligent manner, but someone like Jean Clair should have taken over, and above all, exhibiting many more works. This is therefore neither an exhibition nor even a special-study exhibition because in order to set up an in-depth study, one needs to establish a purpose. This assembly of fourteen works lent by Beaubourg, to which a fifteenth was added by the FRAC Nord-Pas-de-Calais, does not have one. In fact, this project of the Centre Pompidou Mobile runs contrary to the interest of the museums and their permanent collections. By favoring a transient phenomenon over a lasting one, attempting to turn pigs’ ears into silk purses, a group of fifteen works into an exhibition, the public is discouraged, rather than motivated, from going to a museum. 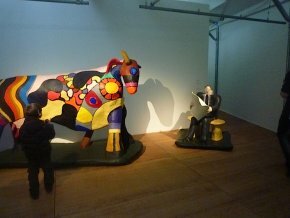 Indeed, when we visited, the museum in Cambrai was practically empty whereas people were standing in line for the Centre Pompidou Mobile. The day we went (to Cambrai, during February school vacation), we had to wait almost half an hour although the line was not that long. How is it on the weekends ? The inside, narrow and cramped (ill. 2), the guided visits and the audio-guides, practically mandatory (visitors listen more than they look), quickly fill up the small space and even endanger certain works : we saw a child touching the sculpture by Niki de Saint-Phalle (ill. 3) on purpose, without any reaction from a museum attendant. The reason is simple : despite the reduced size of the exhibition space, there was no one to watch over the room. In these conditions, one might point to the impressive attendance figures. The results are clear : there is practically no hope that a visitor venturing out once to a museum will become a confirmed art lover. The statistics for the museums in Chaumont, communicated to us by the city, total 304 visitors from 15 October 2010 to 10 January 2011, as opposed to 541 for the same 2011/2012 period, the dates when Beaubourg was present. These numbers are so insignificant that one hardly dares mention them, when at the same time the Centre Pompidou Mobile drew 35,220 people. And this miniscule ripple effect only lasted barely two months because during the third, the number of museum goers decreased, from 107 to 97 compared to the same period the year before ! This does not prevent the Centre Pompidou’s press release from claiming that "the attendance of these museums has doubled compared to the normal results observed at the same period of the year" . This is objectively false for the period corresponding to the presence of the Centre (the increase is of 77%) and totally biased since this miniscule ripple effect only lasted two months. It is true that Alain Seban likes to play with figures, as shown already by Bernard Hasquenoph of the website Louvre pour tous in a 2010 article whose conclusions still apply today. The museums in Chaumont will now return to their few hundred annual visitors while we ponder the fact that the money spent to bring the Beaubourg Circus, might have provided a welcome spark to these establishments if it had gone into their coffers. Since culture is only conceived in terms of "events" today, this itinerant Centre Pompidou could have been organized hand in hand with the museums, and not against them, by staging a true temporary exhibition inside their walls, structured with a real purpose, accompanied by a catalog, without treating visitors as if they were ignorant. True, the original idea was to take the Centre Pompidou Mobile to cities without a museum, which turned out to be almost impossible, as these are too small and cannot afford it financially. Therefore, the stops on this itinerary are all cities which already have one or more museums. Next year, the Centre Pompidou will even pay a call at Le Havre and Nantes, cities with two of France’s richest establishments, notably of modern and contemporary art. This waste of public funds in an area which is cruelly lacking is truly insufferable. The budget shown for Cambrai was of 400,000€, for Chaumont 500,000€. Actually, it would seem this is the cost each time, with 400,000€ corresponding to the minimum amount. The breakdown for Chaumont is the following : 200,000€ rental fees ; 80,000€ technical fees and 120,000€ personnel fees ; an added 50,000€ goes for media expenses and another 50,000€ for supplementary fees. 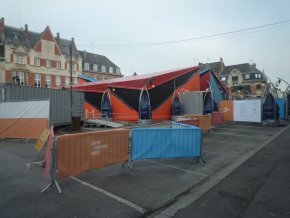 The city of Cambrai, due to school vacation and the absence of those involved, was not able to give us more details but did confirm the figure of 400,000€. However, for the city of Chaumont, we were not able to obtain the budget of the two museums. For Chaumont, the city "only" contributed 149,500€, the rest provided by the Ministry of Culture (83,500€), the region (100,000€), the department (100,000€) and an "exceptional subsidy" by the Ministry of the Interior. We remind our readers that the mayor of Chaumont is the Minister of Education nationale, Luc Châtel. Press release issued for the Centre Pompidou Mobile, 14 February 2012.